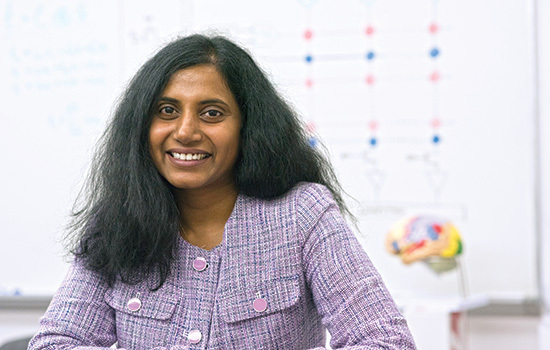 Dhireesha Kudithipudi, a professor of computer engineering, is part of a growing group of RIT researchers working in artificial intelligence. Some of RIT’s professors are teaching very different kinds of students. Their classrooms are labs, and the students are high-tech computers being taught to think. There is a growing group of RIT researchers working in a field broadly known as artificial intelligence, or AI. They are building increasingly complex algorithms—the rules that govern operating systems—so that machines can perform tasks that normally require human intelligence, including making decisions. As part of RIT’s Center for Human-Aware Artificial Intelligence, these faculty researchers believe their work, with multi-millions of dollars in funding from the National Science Foundation, National Security Administration, Air Force Research Labs and other prominent organizations, could lead to breakthroughs in everything from health care to energy management to cybersecurity. RIT is uniquely positioned to tackle this area because the university has the right combination of people with expertise in AI, as well as researchers in specialized fields, such as American Sign Language and imaging science. Work at the center builds on national priorities for AI, where the economic impact is projected to increase global GDP by nearly $16 trillion by 2030, according to a 2017 report by PricewaterhouseCoopers. “There is a huge opportunity for researchers in this domain, but the tricky part is that these researchers need to be truly interdisciplinary,” said Kudithipudi, director of the center, who is seeing some of those interdisciplinary connections being made. AI is an umbrella term for multiple fields of computing technologies—deep learning, computer vision, neuromorphic computing, natural language processing, for example—strengths of the faculty researchers involved in the center. These strengths became the center’s four key areas: brain-inspired computing, machine learning and perception, automation and human-centered AI. Projects will address society’s challenges in the areas of manufacturing, cybersecurity, sustainable systems and energy develop–ment, and improve medical care and technology. They will also address deeper questions such as how do humans and machines interact with each other and how do machines interpret intent. “The benefits and future successes of AI will come from multiple disciplines and people who come together to develop new application domains,” Kudithipudi said.